Darin joined the council in 2018. 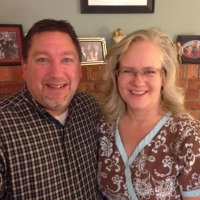 Darin and Becky have been a part of the ALCC family for the past 13 years. They have been married 26 years and we have 3 sons (Connor--22, Joel--19, & Derek--16). Their family has served in various capacities at ALCC including Set-Up & Tear-Down Crew, Children’s Ministry, Sound, Worship, and at Church Family and Youth Summer Camps. Darin has been a teacher in the Sumner School District (Lakeridge Middle School) for the past 20 years and Becky has been a nurse at Auburn Medical Center for 20 years. They are licensed foster parents and have had the privilege of bringing 3 girls into their home for a time. Darin has coached soccer at all levels in the Bonney Lake community for over 20 years and is currently a high school referee. Their family loves to spend summers hiking and camping and hanging out with our extended family. They are grateful for the role our church family has played in their family’s life. Darin and Becky both feel they have been truly blessed!